Here is a round up of bookish favourites for the month of October, 2015. For a glimpse into September, 2015’s Bookish Favourites look here. 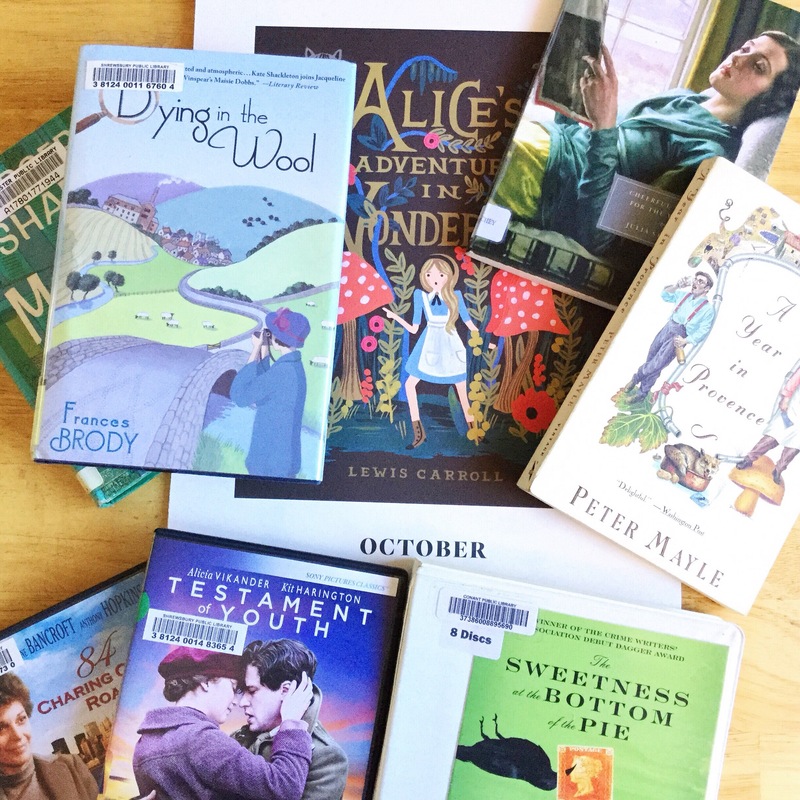 The month of October was a fine month for reading. After reading only two books in September I managed to read a grand total of nine books! Most of the books were superlative reads. A Year in Provence (4/5*) by Peter Mayle describes the author’s year long diary style narrative of spending a year in a small village in Provence. The writing style is simple yet descriptive. A beautiful travelogue. I tried to read a chapter a month this year (corresponding to the month described in the book) but decided to finish the book off in October. For a look at my art journal entry based on the cover illustration look here. A Murder is Announced (4/5*) by Agatha Christie. This is Christie at her best. A Murder is Announced is a Miss Marple story. In the small village of Chipping Cleghorn a murder is announced in the local gazette. The murder will take place at 6.30 pm on October 29th at Little Paddocks.Various neighbours and members of the household gather in the living room at the stipulated time. The lights go out at the exact time announced and a masked intruder charges into the room and orders everyone to stick their hands up. A gun shot is fired and when the lights turn on, the hooded guest is found dead on the floor. The motive behind the killing forms the core of the mystery. I enjoyed the structure of the story. Each chapter led us methodically, deeper and deeper into the mystery. Cozy, delicious details of village life in the Cotwolds interspersed the detecting. Miss Marple at her very best! A very enjoyable read. 84 Charing Cross Road (5/5*) by Helene Hanff. This is an account of the correspondence between Helene Hanff, a freelance writer in New York and Frank Doel, an employee of a used antiquarian bookstore in London. The correspondence is spread over the years 1949 to 1969, documenting the lively dialogue between two people, with nothing in common but a knowledge and love of good books. Set in the years after World War II, the reader is treated to an insight of the reality of what it was like to live in the aftermath of the war. The book is funny and poignant and shows how people separated by great distance and circumstances can nonetheless, touch each others lives and create the most beautiful of relationships.For a full review click here. The Priory (5/5*) by Dorothy Whipple. Inspector French’s Greatest Case (4/5*) by Freeman Wills Crofts. I reviewed Inspector French’s Greatest Case by Freeman Wills Crofts as part of Simon from Stuck in a Book’s #The1924Club. In the second half of October everyone was asked to review books published in 1924. The link to the complete list of blogger reviews is here. In ‘Inspector French’s Greatest Case’ we are introduced to a case of murder that occurs at the offices of Duke and Peabody, a diamond merchant located at Hatton Garden in London. On a cold night in the middle of November, the body of an employee, by the name of Mr. Charles Gething is discovered prostrate on the floor in the inner office of Mr. Duke. Mr. Duke’s large Milner safe has been ransacked with the loss of thirty-three thousand pounds worth of diamonds and a thousand pounds in bank notes. Mr. Gething has undoubtedly been murdered as evidenced from the ugly wound made to the back of the skull by a blunt instrument. The theft of the diamonds and money previously secured in the safe are the motive behind the murder. To investigate the case, Inspector French of the Criminal Investigation Department of New Scotland Yard is called in. For a full review of the book click here. Dying in the Wool by (3/5*) by Frances Brody. This a ‘cozy’ mystery set in post World War I Yorkshire. It is the first in the detective series starring an amateur sleuth- Kate Shackleton. In this case, Kate investigates the inexplicable disappearance of the father of an old friend of hers. The man in question, was a fabric mill owner. Though the characters in the story were well drawn and the details of the period depicted sounded authentic, the story failed to grip me. Martha in Paris (4/5*) by Margery Sharp. This is the second book in the ‘Martha Trilogy’ of Margery Sharp , the first of which was ‘The Eye of Love’. In this book we find that the unusual character of Martha has grown up. She is eighteen and about to embark on an adventure. She is to stay in Paris for two whole years to study art. This short book is quirky and funny and made me laugh frequently. It also made me ponder about the trials and tribulations of falling in love with a person with an artistic temperament. Cheerful Weather for the Wedding (5/5*) by Julia Strachey. This is the most unusual book I have read this year yet so very wonderful. This is a Persephone Classic. It describes at length the wedding day of a young girl who is reluctant to get married. The bride takes to glugging a bottle of Jamaica Rum in her bedroom to quell her fears whilst downstairs a strange collective of characters have assembled to participate in the wedding celebrations. There are eccentric relatives, friends, a former beau who wishes to propose and yet is not certain of himself and a bevy of peculiar servants who help in the wedding preparations. The book is interspersed with memorable dialogues. I highly recommend this book! Most of the blogposts this month were book reviews. I published eight book reviews excluding this round-up post this month. Four were reviews of children’s books: Blueberries for Sal, Tuesday, Goodnight Moon and Owl Moon. The remaining four were reviews of ‘grown-up’ books- including The Eye of Love, Inspector French’s Greatest Case, 84 Charing Cross Road and The Priory. Since I devoted most of my evening leisure time to reading I didn’t watch as many movies or TV series as usual. I did watch dramatizations of Miss Marple’s A Murder is Announced (starring Geraldine McEwan), 84 Charing Cross Road (I was not a fan of Anne Bancroft’s acting; I felt it was slightly too affected), a re-watch of Far From the Madding Crowd starring Carey Mulligan (the movie makes me want to re-read the book), Testament of Youth (re-watch) and Hocus Pocus on Halloween. I started listening to Alan Bradley’s book ‘The Sweetness at the Bottom of the Pie’ on audio starring a young detective Flavia de Luce. This was fresh on the heels of completing the brilliant audio series ‘In and Out the Kitchen’ written by Miles Jupp. I am devoting the majority of next month’s books to reading Children’s Literature for #ReadKidsLit. I hope to discover/ rediscover the joy of childhood tales. Here is a peek at next month’s ‘TBR’ pile. Wish you all a happy and bookish November!